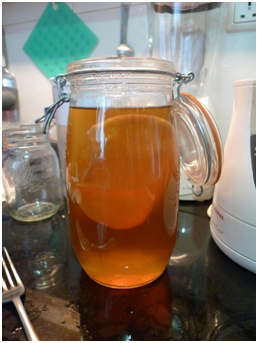 Brewing kombucha tea is fun and easy, with many people now brewing kombucha in the comfort of their own homes. And like with other hobbies, the more you brew kombucha the better you become at it! If you brew kombucha in your own home but are unsure as to whether you are getting it right, or you are looking to start brewing kombucha and are looking for some top tips, this article is definitely for you! Kombucha has its own smell and this is a smell that longtime brewers will recognize instantly. The smell of kombucha is sweet and sour at the same time, boasting a slightly vinegary aroma. It may take a few times to recognize what kombucha smells like but once you know, you know. As well as tasting your kombucha batches daily you should smell them, ensuring that your kombucha does NOT smell like rotten eggs. One of the most obvious signs of healthy kombucha is the formation of a new scoby (symbiotic culture of bacteria and yeast). This formation may vary in time to appear depending on a number of things such as temperature, air pressure and season. You want to have some yeast but not too much. For that reason, it is important to always use starter liquid from the top of your brew where it is bacteria-rich. Healthy kombucha has low pH with the average pH of properly fermented kombucha being between 3.2 and 2.5. When brewing kombucha you should invest in a pH meter to monitor your brew’s progress. A correctly brewed batch of kombucha should lighten in color throughout the fermentation process. You should keep an eye on it all times. These are only some of the ways you can check that your kombucha is a healthy as possible too – don’t forget that the ultimate test is the taste test so always taste your home-brewed kombucha before offering it to your friends.